Chances are, if you've written a grant proposal for a large national foundation, you've had to include information about your organization's "theory of change." Foundations like the W.K. Kellogg Foundation and the Hewlett Foundation require fluent discussions of the theory of change that drives your organization or program. But even if most of your grant proposals go to smaller local foundations whose donors and proposal reviewers may not know the term "theory of change," your proposals will be strengthened if you know and can articulate how your organization creates social value. A theory of change can make the difference between a grant check and a turn-down letter. Many grantmakers look for a theory of change in any project they are considering supporting -- and once they understand why you believe that what you propose to do will result in the change you want to see, funders also scrutinize your budget to make sure the resources you have are adequate to pull this off. In the cartoon below (which I found on a blog about international development), we see a grantseeker who didn't make his theory of change quite clear enough. Let's dig a little deeper into what a theory of change looks like. A theory takes two concepts and marries them to each other. The asteroid married to the dinosaurs results in the extinction of the dinosaurs. Smokers married to the capacity of quitting result in reduced risk of cancer. A theory of change makes clear and convincing links between the activities of a nonprofit and the outcomes it wants to see in the world. As defined by Grantmakers for Effective Organizations, theory of change “is a systematic assessment of what needs to happen in order for a desired outcome to occur. Theories of change should be designed to explain how and why change happens, as well as the potential role of an organization’s work in contributing to its vision of progress." One of the nifty things about theories of change is that they make you articulate your assumptions about how the world works. Once that assumption is out in the open, it can be tested, or backed up by existing credible research. Heifer International's "coffeelands" projects help to ease food insecurity among small-scale coffee-growers by diversifying coffee farmers’ income and helping them to grow and raise their own food sources. KaBOOM! (which builds playgrounds) believes that powerful citizenship can be activated by pursuing smaller common goals (a playground, skatepark or field complex) via a one-day build that results in achievable wins, toward collective causes (the well-being of children). 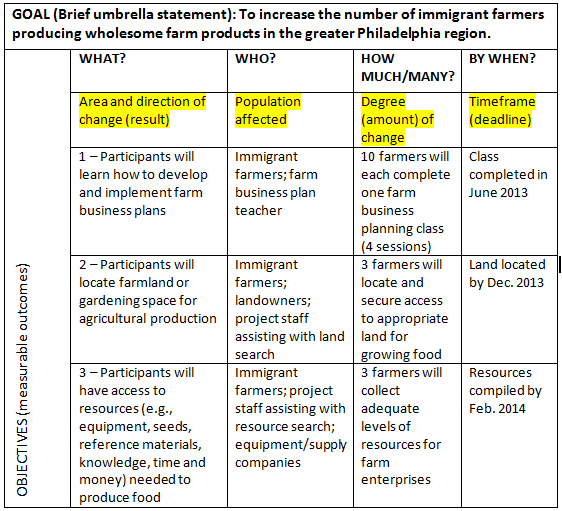 Here's how to write a theory of change. The organization ActKnowledge has an online "Theory of Change Community" that will give you a number of resources to get educated and skilled in working with organizations to create theories of change (most of the resources are free). The organization is available to give on-site trainings and consultations as well. 1. Start with a strategy that is important to your organization (one that you do, or are considering doing). Example: We teach low-income people how to efficiently cook meals from scratch with affordable, healthy ingredients. 2. Add the words "so that" to your strategy. So that people will have the resources to feed their families more nutritious food at home. 3. Add another "so that" to the first "so that" idea. So that families can become more resilient because they have improved their health through better diets and saved money through less eating outside the home. 4. Add another "so that" to the second "so that" idea. So that there are positive changes in the lives of vulnerable children and families, with the possibility of children learning essential life skills to teach future generations. 5. Keep going until there are no more "so thats." At the logical end of the "so that" chain, you have revealed the ultimate outcome that your strategy and activities are capable of producing. Your theory of change says that this final "so that" can be brought about by your organization's strategy. Do you need more help with your grant proposals? Check out my favorite grant proposal writing tools, including three books that can guide you every step of the way. You'll turn to these every time you're writing a proposal. 1) How to Say it: Grantwriting -- Write Proposals that Grantmakers Want to Fund, by Deborah Koch. The National Science Foundation gives this book out at trainings for new applicants to some of its programs. This book is a game-changer for people writing federal grant applications, and the advice is also spot-on for proposals to private foundations. The advice is easy to follow and you'll get some new ideas about details such as how to format charts in your applications. 2) Grantsmanship: Program Planning and Proposal Writing by Norton Kiritz and Barbara Floersch. If you had taken a course in college on grant proposal writing, this is likely the textbook your professor would have asked you to buy. It's that good! The authors are affiliated with the Grantsmanship Center, a premier training organization, and this is the organization's signature publication. You might not have the bucks or time to attend one of their five-day intensive workshops, but I know you can find the time to read their book if you want to succeed in grant proposal writing! 3) The Only Grant-Writing Book You'll Ever Need by Ellen Karsh and Arlen Sue Fox. Well, clearly I don't think that this is the ONLY (!) grant proposal writing book you'll ever need, but it's in the top three. It's written by a team of two women with tons of experience writing proposals for New York City nonprofits and agencies. Want to learn more about theories of change and systems thinking in particular? I recommend this book: Systems Thinking For Social Change: A Practical Guide to Solving Complex Problems, Avoiding Unintended Consequences, and Achieving Lasting Results, by David Peter Stroh. Affiliate links are used here, which means at no extra cost to you, making a purchase by clicking this link helps support this site. Thanks! As part of my master’s degree thesis, I am developing guidelines based on research evidence for improving nonprofit appeal letters. Here are my top ten takeaways from the scientific literature on nonprofit appeals. 1) Be sure that your fundraising letter includes a story about an individual beneficiary, and create follow-up materials (especially thank-you letters) that circle back to the story of the beneficiary, indicating that the donor’s support has improved this person’s (or animal’s) life situation. Merchant, Ford and Sargeant (2010) ran an experiment finding that stories can influence donors’ emotions and intentions to give, and that donors would be more likely to give again if thank you letters and reports reference the original story told and provide information about impact of the donor’s gift. 2) Include at least one photograph of a program’s beneficiary in a fundraising letter, and carefully consider selecting “sad-faced” photos. As noted in Lipovsky’s (2016) study of French fundraising letters through the lens of functional linguistics, text and images work together to engage readers, and photographs can convey important meaning that text does not. It is advisable to include only the photographs that show a single beneficiary (or at most, a very small family group), because photographs that show large groups of people can give donors compassion fatigue and discourage them from giving. Photos should look natural and be easy to understand. As determined by Small and Verrochi (2009), people are more likely to donate to charities after viewing photos of a sad-faced child. Be sure to tell stories of real victims and/or real beneficiaries – avoid using actors or composites. Shanahan and Hopkins (2007) found that people viewing a Mothers Against Drunk Driving (MADD) advertisement were more likely to state proclivity to donate to this nonprofit if the advertisement pictured an actual or implied victim of drunk driving, not a person who was an actor or composite of a victim. 3) Employ “loss framing” messages when writing to audiences known to feel at risk of a loss related to the nonprofit’s cause. Cao (2016) found that loss framing (discussing the negative consequences of not taking a promoted action) can more effectively result in donations from people who perceive themselves as susceptible to a related loss. In Cao’s study, the “loss-framed” appeal that respondents reviewed was a message from St. Jude Children’s Research Hospital telling the story of Lisa, a baby treated for leukemia at the hospital. Respondents were told that without donations, the hospital would not be able to prevent the deaths of 7 out of 10 children like Lisa. In contrast, a less effective gain-framed appeal stated that 7 out of 10 children like Lisa would be saved due to individual donations. 4) Be sure that the appeal letter directly asks for money and makes clear that the reader is being asked to donate; and if resources allow, send multiple appeal letters at different points in the year rather than one single annual appeal. Yoruk’s (2009) analysis of data from the Survey of Giving and Volunteering (SGV) in the United States found that being asked to give to a charity increases a donor’s propensity to give by 19 percentage points. 5) Partner with a foundation, corporate supporter or major donor to offer a “bonus trigger incentive” for giving instead of the more typical match offer. Helms-McCarty, Diette, and Bugg Holloway (2016) discovered that “bonus trigger incentives” (promises made in an appeal letter that if a person gives at any level to the nonprofit, then a certain fixed dollar amount will be added to that donation by a funder partnering with the nonprofit to help its fundraising efforts) can nearly double donations from acquisitional (new) donors, as long as the promised incentive is large enough (in this case, $10). These researchers found that the presence of a bonus trigger incentive does not change the average donation size, but that offering smaller bonus trigger incentives ($1 and $5) was not effective. So offer at least $10, and more if possible! As was done in the Shang, Reed and Croson experiment with public radio donors calling into a pledge drive, social cues can be as direct and explicit as telling prospective donors that another radio station member just contributed $240. The impact can be stronger if prospective donors are also told that this other donor was of the same gender or other distinguishing identity as the prospective donor, and if the prospective donor can be put into a mindset of thinking about other people rather than oneself. The risk is that, as Shang and Croson discovered, telling a prospective donor about another donor’s lower donation can result in that prospective donor lowering the amount of money he or she gives as well. In this way, “upward social information” benefits nonprofits’ fundraising revenue, while “downward social information” may harm it. 7) Experiment with divulging social norms as a general strategy to increase responses to appeals. In line with the specific tactics studied by Shang, Reed and Croson (2008), Martin (2012) discusses the general utility of discussing how “people like you” are behaving in order to modify the audience’s behavior. In the context of letters sent by the British tax authority that increased payment of overdue taxes by telling readers that the vast majority of people in their neighborhoods do pay their taxes on time, Martin recommends that data about the social norms be as localized as possible (e.g., zip code-based rather than regional); that the social norm be about the behavior that is desired, not the behavior that is not desired; and that the social norm information be based on an actual study or otherwise verifiable information. 8) Devote more resources to creating effective appeal letter packages for acquisition donors (those who have not given before) than resources devoted for appeals sent to prior (renewal) donors. Diamond and Gooding-Williams (2002) found that attitude toward an appeal letter was a stronger factor in a person’s decision to donate if the person receiving the appeal had not previously donated to the nonprofit. Burnett and Fowler (1997) found that current donors are more likely to give the benefit of the doubt to communications materials from charities that they already support, while these donors hold charities they have not (yet) supported to a higher standard in written communications. 9) Make judicious use of the “signals” that can help a reader trust the nonprofit asking for funds. Handy (2000) identified the signals of trustworthiness that are often used to good effect in appeal letters: longevity of the nonprofit; service by board members who are prominent or respected in the community; affiliation (including receipt of grant funding) with other trustworthy organizations; obtaining audited financial statements; publishing information about administration and fundraising costs; documenting past achievements in quantitative form; asking for nonmonetary contributions (e.g., volunteer hours or in-kind donations); and receiving testimonials and favorable mentions in the press. To counter this, appeals can address donors’ concerns about salaries, administrative costs and marketing; provide evidence that the nonprofit’s programs are effective; provide charity watchdog ratings; speak to the personal connection of the prospective donor to the cause (if a connection is known); and personalize letters when appropriate to connect the prospective donor to a person that he or she knows at the nonprofit. 10) Maximize discussion of the nonprofit’s effectiveness for larger donors, and minimize discussion of effectiveness for smaller donors. Karlan and Wood (2016) found that analytical/scientific information about outcomes of a nonprofit’s activities did not impact average donations overall, but that large prior donors were responsive to effectiveness information, while small prior donors perceived the same information as a deterrent to giving. So there you have it… ten practical tips from peer-reviewed academic articles that can be applied to your nonprofit’s fundraising. Keep in mind that all approaches need to be customized for the audience and nonprofit. When in doubt, test! Does finding, reading and interpreting scientific articles seem a bit intimidating? (It did to me when I started this project!) If you don’t routinely read scholarly articles, try the following approach. First, to find peer-reviewed research articles on topics related to nonprofit fundraising, use google scholar. For my research, I used search terms such as “nonprofit appeal letters,” “nonprofit direct mail” and “charity appeals” to find articles. I also reviewed the table of contents of all recent volumes of journals dedicated to our field -- Nonprofit and Voluntary Sector Quarterly, Nonprofit Management and Leadership, Journal of Nonprofit and Public Sector Marketing and the International Journal of Nonprofit and Voluntary Sector Marketing. Once you have your hands on an article of interest, read the abstract to understand what was studied and what the researcher’s results were. Next, read the introduction, where the topic is framed and the focus of the article is introduced – the last paragraph of the introduction usually encapsulates the question and the methods used. Methods and results can be glanced over at first. Pay attention to the figures – if done well, they should graphically tell the story of the results. Read the discussion – here, the first paragraph encapsulates the findings in plain language and then goes on to discuss context, implications and applications. If any of this piques your interest or raises questions in your own mind, return to the methods to consider the researchers’ approach and how/if it applies to your work. Do the pages of statistics and formulas throw you off? Don’t fear – you don’t have to fully grasp the methods in order to understand the research. These articles have been peer-reviewed and the methods should be sound. But use your own common sense to weigh the results. For example, I found a number of peer-reviewed studies of appeal letters that used college students as research subjects, even though the students aren’t representative of a nonprofit’s typical donor, who is older. Results of such studies can be of limited applicability to your nonprofit. You might not be surprised to hear that there is a big divide between academic researchers and nonprofit communications/fundraising practitioners. While there are good reasons for this divide, it’s high time for researchers and practitioners to collaborate much more closely in researching topics of interest to people working in the trenches in nonprofit fundraising. Burnett, K. and Fowler, J. (1997). How to make sure your donors read your publications. International Journal of Nonprofit and Voluntary Sector Marketing, 2:4, 299-309. Cao, X. (2016). Framing charitable appeals: the effect of message framing and perceived susceptibility to the negative consequences of inaction on donation intention. International Journal of Nonprofit and Voluntary Sector Marketing, 21:1, 3-12. Diamond, W. & Gooding-Williams, S. (2002). Using advertising constructs and methods to understand direct mail fundraising appeals. Nonprofit Management & Leadership, 12:3, 225-242. Handy, F. (2000). How we beg: The analysis of direct mail appeals. Nonprofit and Voluntary Sector Quarterly, 29:3, 439-454. Helms-McCarty, S., Diette, T.S. & Bugg Holloway, B. (2016). Acquiring new donors: A field experiment using bonus trigger incentives. Nonprofit and Voluntary Sector Quarterly, 45:2, 261-274. Karlan, D. and Wood, D. (2016). The effect of effectiveness: Donor response to aid effectiveness in a direct mail fundraising experiment. Journal of Behavioral and Experimental Economics, 2016, 1-8. Lipovsky, C. (2016). Negotiating solidarity with potential donors: A study of the images in fundraising letters by not-for-profit organizations. Functional Linguistics, 3:1. Merchant, A., Ford, J. & Sargeant, A. (2010). Charitable organizations’ storytelling influence on donors’ emotions and intentions. Journal of Business Research, 63, 754-762. Shanahan. K. & Hopkins, C. (2007). Truths, half-truths and deception: Perceived social responsibility and intent to donate for a nonprofit using implicature, truth, and duplicity in print advertising. Journal of Advertising, 36:2, 33-48. Shang, J., Reed II, A. & Croson, R. (2008). Identity congruency effects on donations. Journal of Marketing Research, XLV, 351-361. Small, D. & Verrochi, N. (2009). The face of need: Facial emotion expression on charity advertisements. Journal of Marketing Research: XLVI, 777-787. Yoruk, B. (2009). How responsive are charitable donors to requests to give? Journal of Public Economics, 93, 1111-1117.